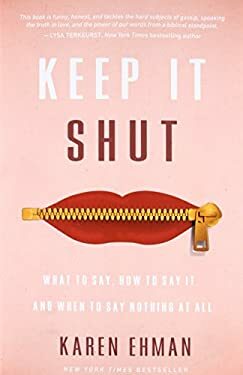 Keep It Shut by Karen Ehman explores how to better control your tongue, knowing what to say and how to say it, and realizing when it is best to say nothing at all. From Bible times to modern times women have struggled with their words. What to say and how to say it. What not to say. When it is best to remain silent. And what to do when you've said something you wish you could now take back. In this book a woman whose mouth has gotten her into loads of trouble shares the hows (and how-not-tos) of dealing with the tongue. Beyond just a "how not to gossip" book, this book explores what the Bible says about the many ways we are to use our words and the times when we are to remain silent. Karen will cover using our speech to interact with friends, co-workers, family, and strangers as well as in the many places we use our words in private, in public, online, and in prayer. Even the words we say silently to ourselves. She will address unsolicited opinion-slinging, speaking the truth in love, not saying words just to people-please, and dealing with our verbal anger. Christian women struggle with their mouths. Even though we know that Scripture has much to say about how we are--and are not--to use our words, this is still an immense issue, causing heartache and strain not only in family relationships, but also in friendships, work, and church settings. New (186 available) BRAND NEW. Over 1.5 million happy customers. 100% money-back guarantee. Make your purchase count: support Better World Books' worldwide literacy partners.